Glass is a huge factor in most contemporary architecture, using large glass elements on both the horizontal and vertical faces of buildings. Oversized glass elements can create dramatic statements, using large, frameless and jointless glass panels creating fixed glass walls and windows that can span over two floors. These types of frameless fixed windows tend to be known as ‘Picture Windows’ and can create a dramatic effect when used effectively. Square edge profiles are preferred for contemporary homes; aluminium is the best option for this effect as you can get much neater, sharper corners and edges than you can get with more traditional materials such as steel. 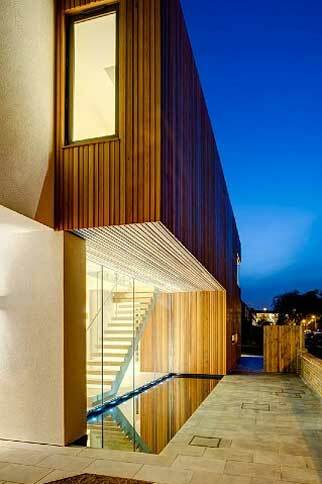 Slim framing to the glass elements is another design aspect to the contemporary design for homes. For aluminium frames to opening elements, IQ offers slim aluminium casement windows and doors as well as our very narrow profiled minimal windows sliding door system. When using the minimal windows sliding doors as rear patio access or balcony doors you can hide all the surrounding framing, with a flush floor finish across the threshold so the only visible framing profile is the vertical 21mm junction. All aluminium frames can be anodised or powder coated to match the design intent for the space but darker powder coated matt greys such as anthracite grey are very popular on these types of builds. On areas or projects where a large amount of glass will be used you need to think about the performance of these glass elements. For a high thermal performance in fixed structural glass or glass in framing systems using IQ’s Super Insulating Glass will greatly improve the overall thermal performance of the glass installation. You could take this even further and use IQ’s Heated Glass on large glass elevations. This could be used as a comfort heating element in conjunction with modern heating sources such as under floor heating, removing any cold drafts from highly glazed elevations, or you could use this technical glass solution to replace traditional heating methods, the glass of your space solely heating the area within. IQ can offer the full glazing package to these types of projects from the large complicated structural elements to balustrades and shower screens.